These are comfortable, soft and light - a basic essential for cool winter weather to wear along with loose sweater or dress. Both leggings in the first and second picture are knitted in charcoal color, it looks different because of the light and retouching. IMPORTANT!!! These leggings are stretchy, but please send me your hips measurements and height so I will see if it needs to be more tight or wide. •	Warmth. 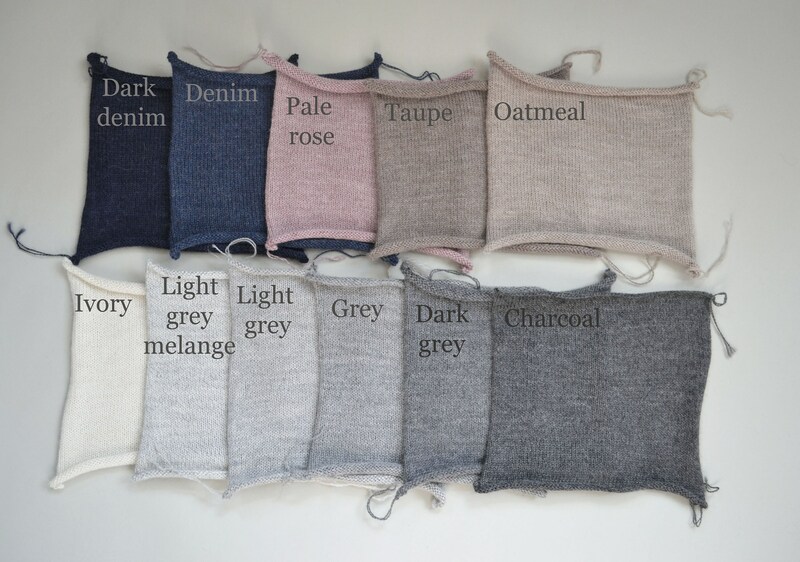 Alpaca fleece is unique in that it consists of hollow cells. It demonstrates perfect insulating properties: alpaca fiber is ideal in cold weather conditions, and protects the child’s body from overheating when it is warm. •	Moisture resistance. Alpaca wool is naturally breathable and does not accumulate moisture (unlike many other fibers), and allows body moisture (perspiration) to evaporate. •	Softness. Baby alpaca is attributed to the most luxurious and soft fibers, such as cashmere. •	Does not cause allergies. Unlike sheep’s wool, Alpaca wool does not contain lanolin which accumulates dust and microscopic allergens. As a result, alpaca wool does not cause allergies and is suitable for baby clothing. •	Lightweight. Dressed in alpaca wool babies will feel warm and comfortable. •	Durability. This type of wool is one of the most elastic and matting resistant of all the known kinds of wool, therefore these clothes can be used not only with your present child, but also for any future children. •	Eco friendly. Apart from the natural origin of wool, this fiber does not need any special treatment. It is naturally soft and lanolin free, which is usually removed from sheep’s wool using various chemical methods. •	Stain resistance. Wool is naturally stain resistant which means you won’t have to wash as often. We accept PayPal as well as credit cards payment. The item you buy will be shipped after your payment received and time needed to complete Your order. We knit using manual knitting machines, wash it and finish it mainly by hand. Some of listed items are made to order so it takes from 2 to 10 days to make it for you. Please let me know if you need your order more quickly for any reason. We ship via Lithuanian Post as Registered Priority Mail and we'll provide you with tracking information. To EU countries it usually takes 3-7 days to arrive. To the rest of the world (USA, Australia and other) it takes about 2-3 weeks to arrive. Unfortunately there are major delays during Holidays season, starting from the end of November. For additional cost we ship via DHL Express ( delivery in 2 days). For that you should choose to ship via DHL while purchasing. In this case please write your telephone number and email in notes section or send me a message. Duties and custom charges are costumers responsibility. We will do our best for our customer to be happy so please make sure the garment you are buying is the right size. We can provide you with exact measurements so you could be 100% secure you've chosen the right size. Returns are accepted within 7 days from the delivery date. To process a return, message us with the order details and the reason for return. Please wait for an email confirmation and instructions from us prior to returning the items. Beautiful leggings, super soft and comfortable, beautifully packaged too!! the tights are beautiful, warm and soft. I will definitely purchase more in the future! Werde noch andere Farben kaufen. Warm, schön verarbeitet. Ich liebe die Leggins.